Trivandrum: Friends of Tibet, one of the principal organisers of World Tibet Day, in association with Natana, the Cultural Club formed by employees of various IT companies based in Technopark, Trivandrum celebrated World Tibet Day by screening Martin Scorsese's 'Kundun', a biopic of His Holiness the XIV Dalai Lama of Tibet. The theater-like hall with perfect acoustics helped viewers feel the essence of the movie, with as much interest shown towards a commercial potboiler. Shri Divas Sadasivan, the Coordinator from Natana welcomed the event introducing Friends of Tibet and its activities. 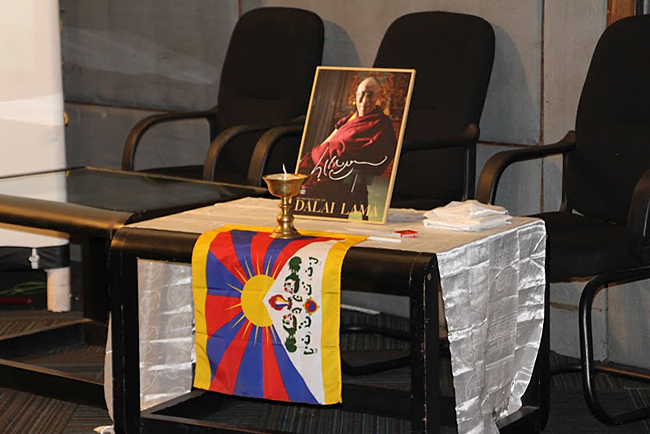 He said that the members of Natana are glad that the club was chosen for the screening and it is a privilege to host the event on His Holiness the XIV Dalai Lama's 80th birthday at Technopark. Shri Eswar Anandan, Campaigner, Friends of Tibet, introduced to the audience World Tibet Day Foundation and the three main goals of World Tibet Day. He also reminded the audience that this is the first World Tibet Day after the demise of its founder, Richard Rosenkranz. Shri Abhilash DS, Admin and HR Manager at Technopark, Trivandrum, inaugurated the function by lighting the traditional Tibetan butter lamp. 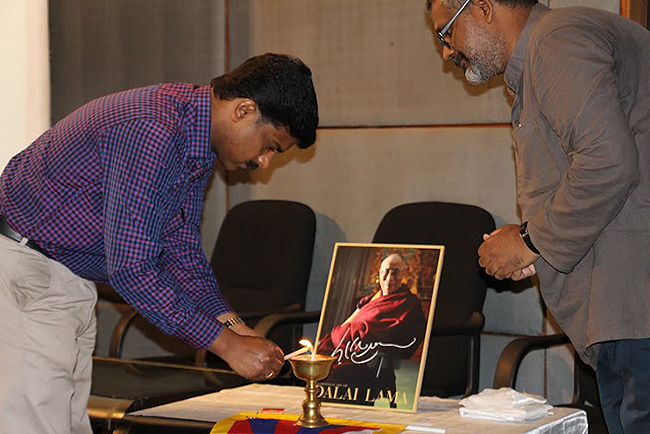 Shri Sethu Das, Director, World Tibet Day Foundation guided him. Shri Sethu Das honored Shri Abhilash DS with 'Khatha', traditional Tibetan silk scarf, and explained to him the eight auspicious symbols of Tibetan Buddhism in it. The audience which included a European guest and people from outside Technopark had come to watch the movie and be part of the celebrations after reading about it in national newspaper. 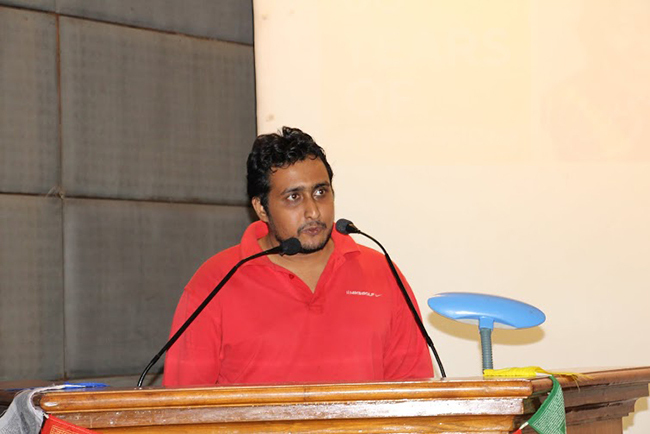 Shri Eswar Anandan, Campaigner, Friends of Tibet introduces World Tibet Day and the significance of the event to a gathering of Tibet supporters and Technopark employees on July 6, 2015 at Technopark, Trivandrum. Shri Sethu Das shared a message he received on World Tibet Day about how Shri Arun Gandhi, the grandson of Mahatma Gandhi was invited to speak at a gathering in China, but he was denied visa by the Chinese Embassy because the authorities found a photo of him with the Holiness the XIV Dalai Lama, posted in his Facebook account! The screening followed and the audience gave a standing ovation at the end, as a mark of support for the cause and the movement for independence. Shri Divas Sadasivan thanked the audience and concluded wishing that the Tibetan people, under the leadership of His Holiness the XIV Dalai Lama, be able to go back to Tibet very soon with dignity. The Natana team distributed sweets to the audience.